A simple grid theme for Hugo. A kind of boilerplate to perform anyone or anything quickly. 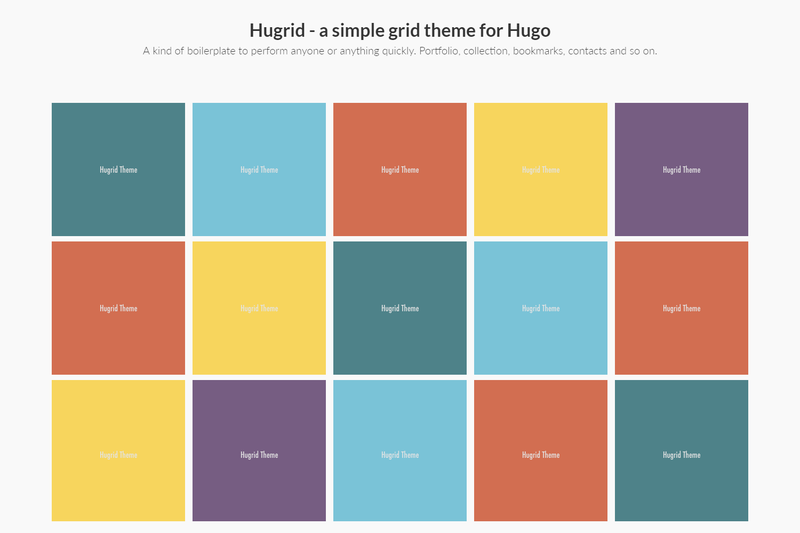 Hugrid (Hugo+grid) is a simple grid theme for Hugo. It’s a kind of boilerplate to perform anyone or anything quickly. Portfolio, collection, bookmarks, contacts and so on. Hugrid is based on Codrops’ Thumbnail Grid with Expanding Preview. Take a look inside the exampleSite/data folder of this theme. You’ll find a file called items.toml. To use it, copy the exampleSite/data folder in the root folder of your Hugo site. Change the strings in the items.toml with your data. to Codrops for original Thumbnail Grid with Expanding Preview.